We all love our phones, yet unfortunate accidents happen to them all the time: dropping into water, screen breaking accidentally, phone crashing down,and etc. When these unfortunate scenarios happen, what’s the most important thing to do? In the past, we can only watch our precious data gone. But now, with Flyme7’s Data Rescue feature, you can export your precious data even when you cannot boot the phone or can’t see anything on the screen! If the phone cannot be booted properly, you can try entering Recovery mode to export all data on your phone disk. Step 1: Power off your phone, and connect it to the computer with USB cable. Press Power key and Volume+ key simultaneously to enter Recovery mode. Step 2: Use Volume keys to select options, and use Power key as ‘Confirm’ option (when entering password). And you can transfer data instantly! If the phone suffered from drowning or breaking, your system works fine but your screen cannot display properly, and you want to get all your data by USB cable but realize that you didn’t set the phone as MTP mode so you cannot reach your data on your computer. What should you do? Don’t worry, Data Rescue feature enables you to access your data by simply sending a message instruction. Step 1: Connect your phone to computer by USB cable. Step 3: When receives the correctly sent message, the phone will switch to MTP mode automatically, which enables you to access all the data on phone disk on your computer. When switched successfully, the phone will play a beep as a reminder. 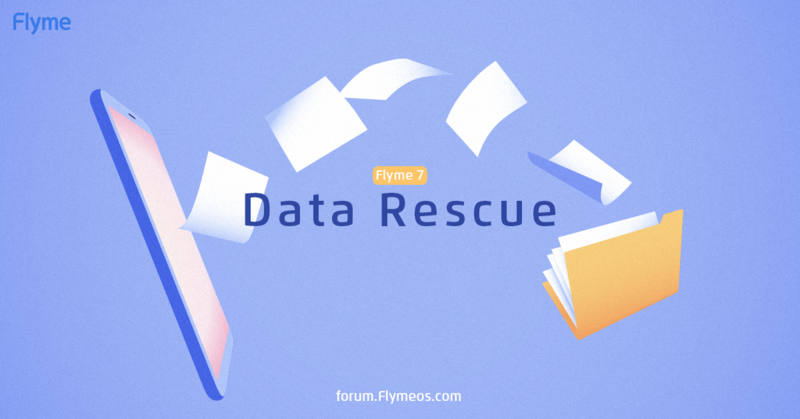 Flyme 7 Data Rescue, a simple way to secure your data and solve your pickle! We hope you won’t ever need this tip, but if unwanted situation happens, don’t forget Flyme is there to help. This is today's Flyme 7 tip tutorial, see you next time! Thanks for such a great tip. Is this feature active by default or we need to activate?